On March 10, 2000, the Nasdaq closed at 5048.62. It was its highest closing ever. It was the peak of the Dot-Com Bubble. In the next 2.5 years the Nasdaq Composite Index would go on to lose 78% of its value. Now, after a wild ride lasting over 15 years, the Nasdaq has finally broken its previous record, closing at 5056.06 on April 23, 2015. While this fact by itself doesn’t mean much for value investors, it does present a good opportunity to look back and reflect at the differences between the Nasdaq during the Dot-Com Bubble and the Nasdaq today. March 10, 2000: The P/E ratio for the Nasdaq peaked at 194x. Valuations for some of the most hyped stocks were even worse: for example, the 8th largest Nasdaq-listed company by market cap was Yahoo, which traded at 1,781x its LTM earnings. April 23, 2015: The P/E ratio for the Nasdaq sits at 23x (for comparison, the P/E ratio for the S&P 500 – which historically has averaged about 15x – is at 21x today). March 10, 2000: Most of the dot-com stocks leading up to 2000 were bleeding cash, relying solely on invested capital to fund their growth and operations. April 23, 2015: Nasdaq companies today are generally much more solid financially. It’s estimated that Nasdaq tech companies have $500 billion in cash. Apple alone has about $25 billion. 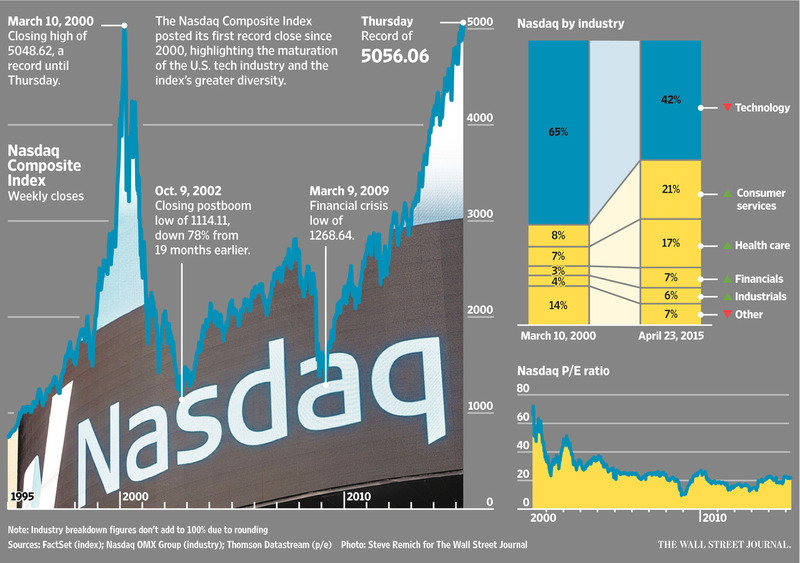 March 10, 2000: 69% of the Nasdaq in 2000 was comprised of technology stocks. April 23, 2015: 42% of the Nasdaq today is comprised of technology stocks, followed by consumer services (21%), and healthcare (17%). March 10, 2000: 4,715 listed companies. April 23, 2015: 2,565 listed companies. March 10, 2000: The 10 largest companies by market cap, in order, were: Microsoft, Cisco, Intel, Oracle, Sun Microsystems, Dell, Qualcomm, Yahoo, Applied Material, and Uniphase. April 23, 2015: Only 3 of the 10 largest companies remain in the top 10 today (Microsoft, Cisco Systems, and Intel). The other 7 no longer exist on the Nasdaq exchange (whether through M&A, bankruptcy, delistings, or moves to other exchanges). The biggest difference between 2000 and 2015 is that, for the most part, the irrational exuberance that pervaded the markets during the dot-com boom doesn’t exist today (but really, will we ever see 200x P/E multiples across the board again?). In the lead up to the market crash, investors were throwing money at any company that had a website. Today, both investors and the companies themselves are much more mature. This isn’t at all to say that the Nasdaq is undervalued or even properly valued right now. And many high-profile stocks like Twitter – or soon to be public stocks like Pinterest and Uber – don’t even generate any earnings, despite their billion-dollar-plus valuations. Other stocks will simply never live up to the high growth rates current market valuations are implying (for example, Netflix and Amazon both have P/E ratios of over 100). There’s nothing wrong with owning “growth” stocks if the price is right (I own shares of Google, Microsoft, and Apple). But value investors should be reminded that if a stock’s purchase price will only make sense if the company lives up to an astronomical growth rate, then it’s no longer an investment – it’s speculation.